1933 evening gown | Oh, The Glamourous Life! First of all, happy anniversary! I’ve been sending you letters for 3 years now! Well, my first missive was 3 years ago yesterday, but who’s counting? I bet you thought I had forgotten all about my 1933 evening gown. Not so! I’ve just been horrifically busy. I managed to carve out a little time to get this gown started. Here you see the bodice all cut out. What’s with the hideous green fabric? Before I cut my lovely silk, I want to make sure everything fits properly. I learned my lesson with the Fit & Flair dress! 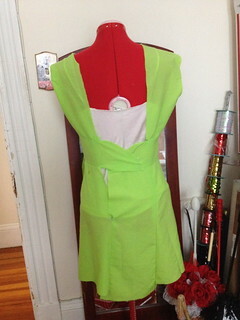 The fabric, by the way, is left over from a Tinkerbell costume from many, many years ago. Hopefully soon, I’ll baste them all together and we’ll see if the pattern needs tweaking. I’ll probably add some shortened versions of the skirts too. This is my lovely fabric from Dharma Trading. Those neatly folded piles are silk charmeuse for the gown and habatoi for the lining. I’ll be turning them silver grey with the dye in the jar. The bottle is a textile detergent for both pre- and post-dye washing. Wish me luck! It’s been a while since I dyed silk. 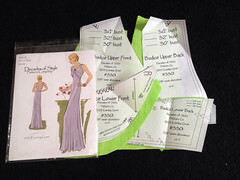 I have a plan for the 1933 Evening Gown. I want to make it in silk charmeuse with a habatoi lining. That was a no-brainer. And I want it to be silvery-grey, which I think will make a nice background for the emerald-green of my new vintage dress clip. And I’d wear the shoe clips too. I’ll probably have to buy new shoes. O woe! Here’s where the crazy part comes in. Silk charmeuse is rawther pricey. I know a place where one can get it for a really decent price, but in white only. So, I started formulating a crazy plan to dye it myself. I save money and the fashion fabric and lining are exactly the same color. And it’s silk, so I can use an acid dye, which requires white vinegar to activate, instead of smelly, caustic chemicals that you can only buy in 10 lb. sacks. It’s not that crazy. I’ve dyed silk before. Several times. Mostly quite successfully. But there was this one time…. Acid dyes want hot water to work well. You can use a large pot on the stove, but I don’t do this enough to be willing to dedicate a pot just for dyeing. So, I use the washing machine. The last time I dyed silk, it was the first time in that particular washing machine. The fabric came out gloriously, a beautiful red that was exactly what I had wanted. And then, because I’m overly cautious, I ran several empty loads with a little bleach, and then some more without bleach, and then a couple of loads of dark clothing. 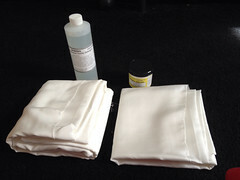 Then, confident that all the dye residue had been flushed away, I washed whites. And my summer wardrobe turned the shade of ripe watermelon. My friends heard my cries of despair and introduced me to Run-Away and Color Catcher sheets. After a lot of work and many tears, I managed to salvage much of the clothing. Later I discovered the washing machine had bad seals or something and some of the dirty water would flow back. I have a new machine, but I’m still scarred by the Pink Incident. Maybe Betty will hold my hand. 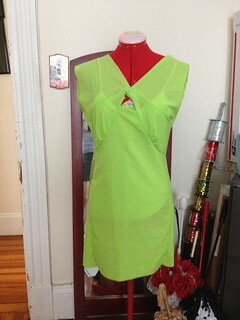 But first, I need to make a mock up of the dress in muslin and check the fit. Then I can start worrying about the silk.